There are lots of luxury vehicles that feature HID or High-Intensity Discharge headlights instead of the conventional halogen bulbs. HID consumes less energy while at the same time increasing night driving visibility up to 300%. HID conversion kits let owners upgrade their cars regardless of the model or make. ​Some drivers hire a professional to complete the installation of HID headlight, while others do it on their own. 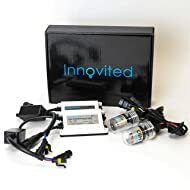 The best HID conversion kit assures you that you will get what you pay for and you will not use again low illumination, energy-consuming halogen headlights for good. This review features 5 of the best high-intensity discharge kit in the market. There are things that you need to consider when choosing the right lighting conversion kit. Items like color, temperature, bulbs, fitment, wattage and other factors are vital to be aware of. If you are not sure which kit to purchase, you will end up purchasing the wrong item. Installing the Kensun Conversion Kit is easy and simple. In less than 20 minutes you can get hold of this lovely new lighting for your car’s headlights. It offers free technical support in case you run into any trouble which can come in handy if you have questions or need help. It is considered as one of the best HID headlight kits in the industry. The lights are 100% shock and weather proof and with universal ballasts that are high performing. It includes mounting brackets with installation instructions. It also has aluminum carrying case for the lights. They are available in different sizes so you are sure that you will get the right size to fit your vehicle. The HID lights offer more light output but with less consumption and last longer. 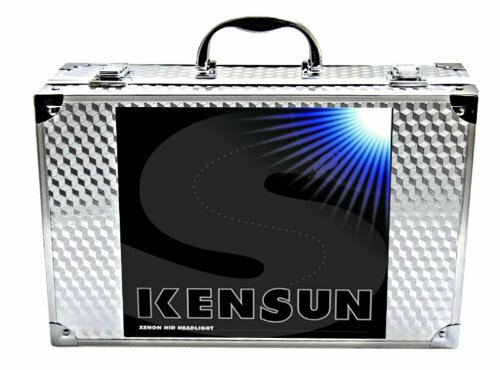 This top HID bulbs of Kensun last as much as 10 times longer under normal conditions. It has 12 color options. Kensun offers users different ways to customize their vehicles. They have the options to choose from the entire color temperature spectrum. Even if they are not street legal, it is good to know you still have this option. If you prefer bright white and almost bluish light this is the best option. Available in different sizes, you will surely find a kit that will fit your vehicle regardless what type of vehicle you have. It has high quality parts. New parts are needed for installation. Although this is a plug and play kit, you need to add new ballasts to install the bulbs. Ballasts are plug in factory wiring harness, but you need to find a place to secure the ballasts. Some use zip ties to secure them. Offers 2 year warranty with #1 Customer Service and Quality. Installation is easy and simple. It normally takes 20 minutes to complete the process. In most vehicles it is Plug and Play with easy to follow instructions. Some vehicles may require the help of a professional installer. The manufacturer offers free technical support with lots of satisfied users. One of the best HID headlight conversion kits you can find in the industry today. The kit includes a smart aluminum carry-case with pair of H11 very bright performance HID xenon lights. It is 100% weather proof, water proof universal high performance 55 Watt ballasts, shock proof and with mounting brackets. It only takes 20 minutes to install the conversion kit. It includes high performance universal ballasts so you don’t have to purchase it separately. When in use it uses 80% less power. Its 55 watt halogen bulb utilizes continuous power draw of ten to fifteen amps, while the HID system utilizes 20 amps to start up. Top rated HID headlight has longer service life. There are 12 color options that you can select from - 4300k (Bright White with a hint of yellow), 3000k (Yellow), 8000k (White light with a blue tinge), 10000k (Light blue) 6000k (Pure white light (some people detect a slight blue), 30000k (Violet/Purple) 12000k (Deeper Blue). The only downside of this product is that you need to find the right location for the ballasts. You need to secure it very well in order for the HID to work properly. 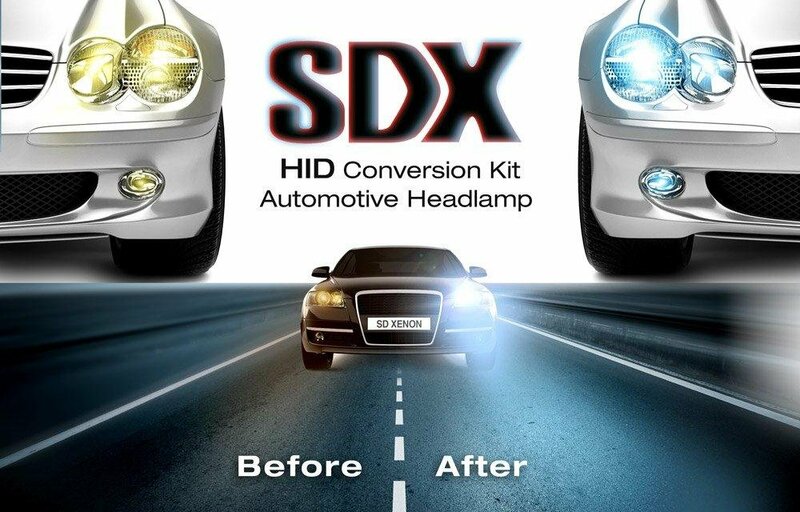 The SDX HID Headlights have a glass chamber that replaces the filament of the old halogen bulbs. The gas is kindled by a 23,000v charge and it remains illuminated by a 12 volt source coming from the ballast which is attached directly to the battery. Amazingly, HID lights offer greater light output that consumes less power. A 35w HID lamp can produce 3 times more light as compared to the 55w halogen bulb. Likewise, a halogen bulb utilizes a continuous power coming from 10 to 15 amps, while the high intensity discharge system can use up to 20 amps for ignition, but it eventually drops up to 3 amps while on operation. Also, the HID bulb has longer service life. It does not have filament to fatigue or vibrate, HID usually last around 10 times longer ​compared to halogen bulbs. The halogen bulbs provide a clearer light and 19% more light output as compared to the standard or OE bulbs. The extra light is more pleasing for some drivers. This kit will fit your budget since this does not cost that much, as compared to others. Available in 12 different colors, this is one more as compared to Innovited. With lots of options you will surely find that will suit your requirements. This kit is available in different sizes. Fitment is not a problem with this kit as you will find the size that you need. This kit does not offer warranty. If you purchase headlight bulbs of any sort, it is always best to have the peace of mind so if in case they don’t work, or if burn out easily you will be able to get them replaced. However, since SDX is #1 in customer service according to them, there is a better chance that they will take care of a problem right away. There are some quality issues with the kit but only minimal. Most users don’t have any problem with the product but some do. When using SDK HID halogen bulbs the power sometimes fluctuates while driving. The Innovited AC HID Xenon Conversion Kit is offered at the lowest price possible. This conversion kit is of high quality, produces supreme light output that offers drivers ​amazing visibility, and ​promotes better comfort and safety during night ​driving. This high intensity discharge consumes 35% less power and produces less heat during operation. High intensity discharge offers longer service life. It does not have filament to fatigue and vibrate, under normal circumstances HID bulbs usually last around 20 times longer as compared to halogen bulbs. The high intensity discharge bulbs come with rubber and plastic gasket. This ensure tight/snug fit on the headlamp assembly eliminates dust and humid to enter. The ballast is absolutely waterproof. It is sealed with rubber sealant. It has mounting screws and plate. One of the greatest advantages is it uses less power to operate. It can help you in upgrading your vehicle. With its plug and play it is easy to use with quick snap connectors. You can install it in any type of vehicle. The ballast is universal that it fits any vehicle which means it will fit in any motorcycle or car. With low profile design, it is very slim. The ballast is waterproof sealed, Shockproof, Dustproof so it will work in any type of weather conditions. Keeping your ballast protective and ensure long term usage of the ballast. This type of light cost higher as compared to others. There are some imitators of HID that are not enough in spite of their brand name. The Extreme Vision provides customers with the most reliable, safest and durable HID on the market today using the newest technology. The company ensures you that their HID products, offer 2 year warranties on their products. The company also offers instant tech support through email or phone to offer the support that you need to get your lights functioning right away. Easy plug and play installation with no required modification. It has 3 times brighter as compared to the halogen bulbs. It usually lasts 5x long that consumes less power. This lighting system includes everything you require to upgrade the halogen lights to HID. The light offers you ​the safety and brightest visibility for the road. The kit is 100% plug and play, enabling easy and quick installation. This kit has 100% waterproof and shockproof with European E-Mark and ISO9001 Certification for 100% guaranteed and product quality. 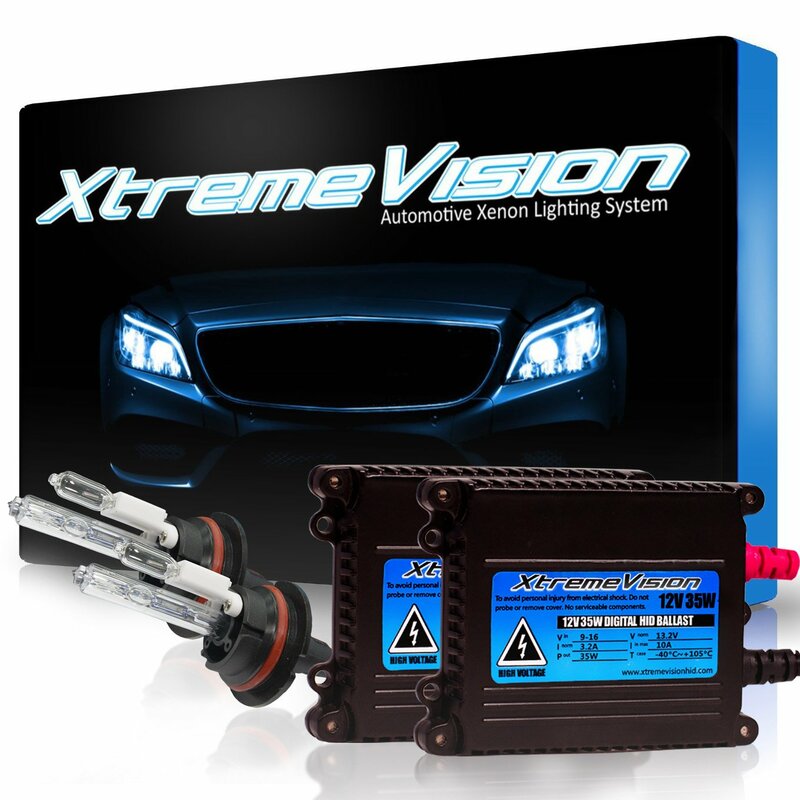 The XtremeVision is one of the best HID kit with premium slim ballast, light blue HID bulbs Plug and Play Wiring Harness. Available in 8 colors with mounting brackets and installation manual. The lights are sometimes too bright and can affect the traffic. Although it conforms with the luminosity limit for headlights, the intensity can cause possible problem for other drivers. These days, one of the most advanced headlights available is the xenon light. Installing them does not only offer better visibility, but ​decreases the need for headlight maintenance and also boosts the resale value of the car in the long run. Unluckily, the oncoming drivers usually complain of HID headlights and ​the blinding effect they have on the oncoming traffic. 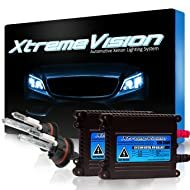 When deciding ​on these xenon lights, you should ​research what sort of bulb will best fit the car you are driving, and the changes needed to the car’s present lighting system to install the xenon bulbs before you make a purchase. The visible color of the light affects the Kelvin bulb’s rating, and which light style is perfect will depend entirely on the driver’s preference and the design he is looking for. With the above features of the xenon lights you will be able to pick which one is the right kit for your vehicle and worth your money. The different HID conversion kit reviews will help you decide which the right kit for your vehicle is.